As you know, WS Display offers a drop shipment service that blind ships orders directly to your customer on your behalf. Meaning, we print your business name and address on a label and place it on the box as the return address and your customer’s information is placed as the shipping address. And if you desire to utilize this service, it is via request. As many of you know we are located in a number of states. The California Department of Tax and Fee Administration, the Pennsylvania Department of Revenue and the State of Hawaii Department of Taxation requires us to collect use tax on purchases shipped to each of their states. Since the South Dakota Vs Wayfair ruling in the Supreme court of the Unites State ruled in favor in the State of South Dakota on June 2018 we are also now required to collect sales tax on a total of 18 different states. This means that we are to collect sales tax on all orders drop shipped on our customers behalf unless we are provided with a copy of a state approved resale certificate of each destination state. Out of state retailers are liable for any tax due. If you request a drop shipment to your customer whose shipping address is located in the states noted below and your place of business is located outside of one of these states, then you are required to pay use tax. *To file for exemption from paying use tax at the time of purchase, you must obtain and submit to us a reseller’s certificate for the state in which the drop shipment is going. To self-report use tax, you will need to apply for a Certificate of Registration-Use Tax on each corresponding state. Please also reference the FAQ section for detailedinformation about each state and their requirements. *If you do not submit a reseller’s certificate, but you need us to drop ship to any of the states mentioned above, then we will collect tax at the time of the order. Please keep in mind that tax for orders shipping to California will be calculated at a 10% mark up and combined sales tax rates in California range from 7.25% to 10.25% - please see the Examples section below. Orders shipping to Pennsylvania will be charged tax at a 6% rate. Orders shipping to Hawaii will be charged tax at a 0.5% rate. Orders shipping to Maryland will be charged tax at a 6% rate. Ex. 1 Your business is based in Nevada. Your customer is located in Carlsbad, California and you request we drop ship it to them. At the time of order, you will be charged tax at Carlsbad’s rate of 7.75% based on a 10% markup of the product. The product will not be marked up for your order; only the taxes due is based on a 10% markup of the product and on the city tax rate. If you submit to us a California reseller’s certificate, then you will NOT pay us any tax. Ex. 1.a. - Let’s say the WSDisplay price for example product is $100, and it drop ships to Carlsbad, CA. Carlsbad tax rate is 7.75%. Ex. 2 Your business is based in New York. Your customer is located in Harrisburg, PA and you request we drop ship it to them. At the time of order, you will be charged tax at Harrisburg rate of 6% tax. If you submit to us a Pennsylvania reseller’s certificate, then you will NOT pay us any tax. 2. Within the email, click the direct link to login to Avalara CertCapture. 3. After logging in, you can select either fill out online form or upload a copy of your certificate. To view your status, simply login back into Avalara CertCapture. Again, use the direct link that can be found in the same email we sent you for your online submission. Avalara is a software for automated tax compliance whom we have partner with to collect and record sales tax. Nexus is a legal term that refers to the requirement for companies doing business in a state to collect and pay tax on sales in that state. A nexus can be created by having a physical presence in the state, having employees. In some cases, however, the use of a drop shipper or a contract with a distributor that functions as a drop shipper is considered a taxable nexus creating activity. What does Blind Drop-ship mean? Blind Drop-ship is the action of moving goods from the manufacturer directly to the retailer without going through the usual distribution channels. As a result, the merchant never sees or handles the product. How is the Sales tax going to be calculated? How would Avalara calculate the sales tax rate? Avalara will look for a copy of a reseller certificate under the CertCapture website, this is a site for Certificate records to be logged and match to each client. If a client has a certificate for the ship to state on file, avatax will not calculate any sales tax but if there isn’t any certificate on file then a tax rule will be applied based on the drop-ship state. Which States do not accept Out-of-state resale Certificates? California, Florida, Hawaii, Illinois, Louisiana, Maryland, Massachusetts, Washington, Washington D.C. I have already submitted a copy of my Seller's Permit, is this sufficient to be sales tax exempt? What is the difference between a Sellers Permit and a Reseller Certificate? 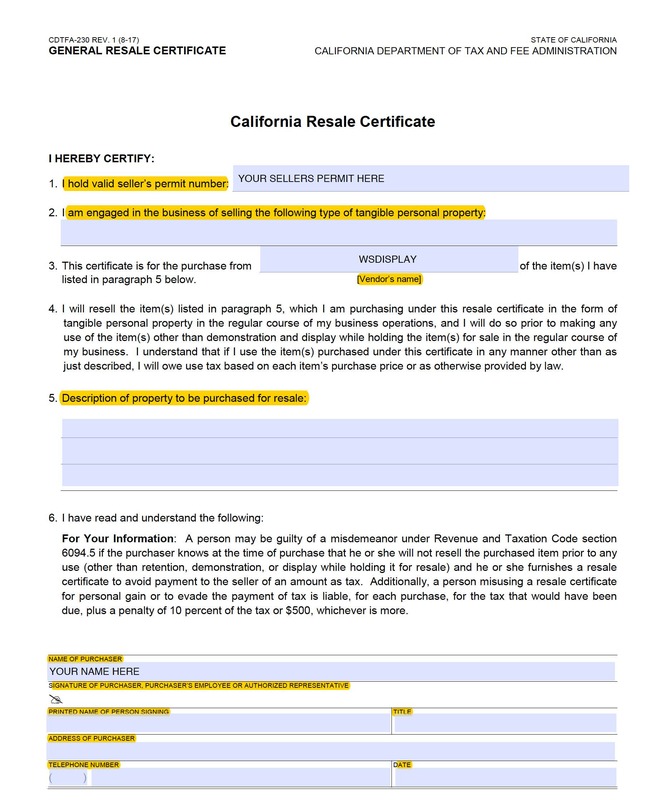 A seller’s permit is a State issued document that allow businesses to make sales in California. Once you have a seller’s permit, you may issued resale certificates to your suppliers to buy items you will sell in your business Operations. Issuing a resale certificate allows you to buy these items without paying tax to the seller. I am an out of state reseller why do I need to pay sales tax to CA? Since we currently have a nexus in the state of California, the state requires us to collect sales tax on all drop shipments to the state of California on our clients behalf unless our clients is registered with the state of California and possesses a Valid California Resale certificate. Where can I get more information about the drop shipment rules? How do I apply for a CA reseller Certificate? I just obtained a California Reseller Certificate, can you refund the sales taxes I paid a 1 month ago? Unfortunately we are unable to refund it for you as the sales tax has already been submitted to the state of California on your sales. I just obtained a California Reseller Certificate, can you refund the sales tax I paid yesterday? A Copy of the except certificate must be provided prior the order is finalized and invoiced, If the order hasn’t been invoiced then it can be adjusted and refunded. Unfortunately once an order has been finalized we are unable to refund the sales tax. What does the Drop ship rule states? For all Drop shipments we are required by the state of California to calculate the retail selling price of all drop shipments of property based on its selling price of the property to the true retail plus a markup of 10 percent (10%) On to which sales tax will be collected. How long is a California reseller certificate good for? California reseller certificate do no have an expiration date and they are good until each company decides to close the account with the State. Why does the state wants us to calculate sales tax based on a 10% markup? The state of California believes that when out of state clients have products drop ship to the state of california by a California Vendor, they are selling the product at a higher cost then what the vendor sold it to for resale. The state of California states that drop ship companies need to collect sales tax based on the retail cost to the California consumer, however if the retail cost is not known by the drop shipper, the state will accept that the drop shipper calculates the sales tax based on a minimum markup of 10% from the originally purchased. By calculating this markup they believe the out-of-state vendor is paying a more fair sales tax to the state of California. Who is Affected by this California Drop ship rule? This rule only affects out of state clients with no California reseller certificate on file and who wish for us to drop ship their Sales order within the state of California. Do we collect sales tax to orders shipping to any other states aside from California, Pennsylvania and Hawaii? No, Currently we are only required to collect sales tax on order where we currently have nexus. If an order is shipping to any other state where we do not have nexus, no sales tax will be collected. I have a California resale certificate but I need you to drop ship my product to my customer in Pennsylvania, Why do I need to pay Pennsylvania Sales tax? WSdisplay currently pays sales taxes in states where we are required to collect sales tax on all drop shipments. Since Pennsylvania is one of our nexus states, we are required by the state of Pennsylvania to collect sales tax on all product ship to a Pennsylvania address unless our client provides a valid Pennsylvania resale certificate Or fill out the Pennsylvania Exemption Certificate and submit this to us. Does Pennsylvania accept my out of state reseller certificate for my sales purchases to be tax exempt? 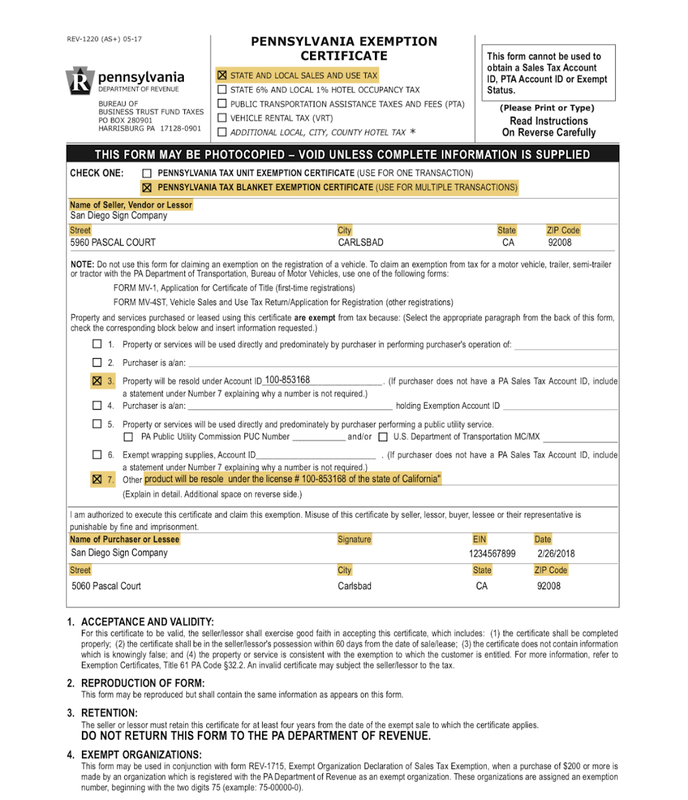 Pennsylvania would accept an out of state reseller certificate in good faith given that purchasers fill out their form REV-1220 and submit this to their vender and explain the reason for their exception. Where can I download a Pennsylvania Exempt Certificate? REV-1220 form can be downloaded it using the link HERE. If I do not submit an REV-1220 form to WSDisplay, how much tax do I need to pay for my drop ship orders to the State of Pennsylvania? Pennsylvania is an origin-base sales tax state, which means sales tax rates are determined by the location of the vendor. Our location base tax in Carlisle PA is 6%. You can call the Office of Chief Counsel at 717-787-1382 or email RA-nexus@pa.gov and talk to a Pennsylvania state lawyer. Which sections of REV-1220 need to be filled out if I am an out of state customer? What is Taxable in the state of Pennsylvania? Sales tax applies to all tangible personal property as well as Shipping and Handling. How much GET do you collect for drop shipments to Hawaii? If I am a non Hawaii resident can I apply for a Tax Exempt Certificate in Hawaii? Currently Hawaii does not issue tax exemption certificates to tourist or other non residents to exempt their purchases from Hawaii Businesses. Would the state of Hawaii accept my out of state reseller certificate? No, currently Hawaii does not accept any out of state reseller certificate for GET exemptions. I am an out of state reseller why do I need to pay sales tax to Maryland? Since WSDisplay currently has economic nexus in the state of Maryland, the state requires us to collect sales tax on all drop shipments to the state of Maryland on our clients behalf unless we are provided with a Maryland resale certificate. Does the state of Maryland accept my out of state resale Certificate for my sales purchased to be tax exempt? No, currently Maryland does not allowed out of state resale Certificate as proof for sales tax exemption. Maryland will only accept their own state resale Certificate. I am an out of state retailer, Can I apply for my own Maryland Resale certificate? Yes, you can but we recommend you to look at their site to see if you qualify for economic nexus status before applying. Where Can I get more information on Maryland Nexus? What does a Maryland Exempt Certificate look like? This is the sample of Maryland Resale Certificate link. HERE. Which sections of the certificate need to be filled out? 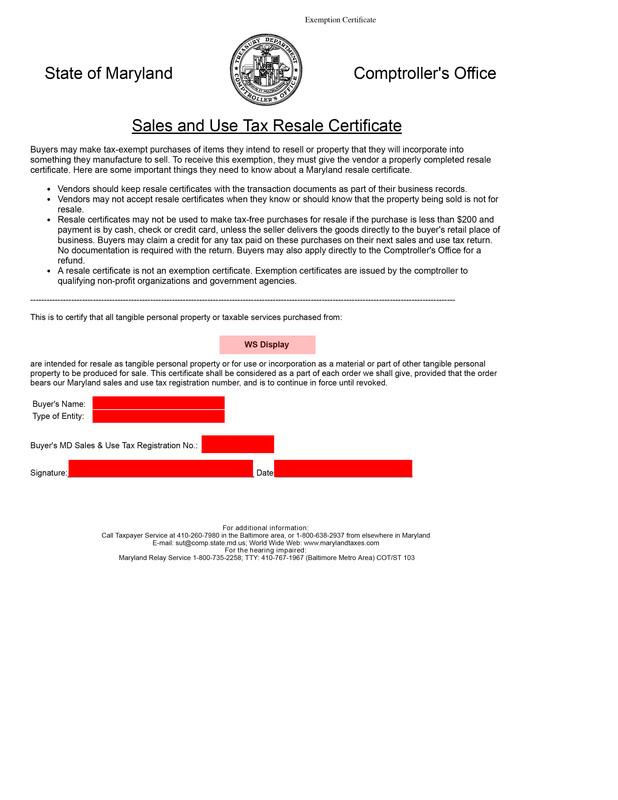 Please see highlighted section on the Maryland Sales and Use Tax Resale Certificate sample below. I am an out of state reseller why do I need to pay Sales tax to Georgia Drop ship orders? Does the state of Georgia accept out of state resale certificates for my sales purchases to be tax exempt? Yes, At the time of publication the state of Georgia would accept the following Certificates for sales tax exemption. Resellers Own State Resale Certificate. I am an out of state retailer, Can I apply for my own Georgia resale Certificate? Where can I get more information on Georgia Nexus? What does the Georgia Exempt Certificate looks like? I am an out of state reseller why do I need to pay sales tax in the state of Indiana? Does Indiana accept my out of state resale certificate for my resale purchases to be tax exempt? 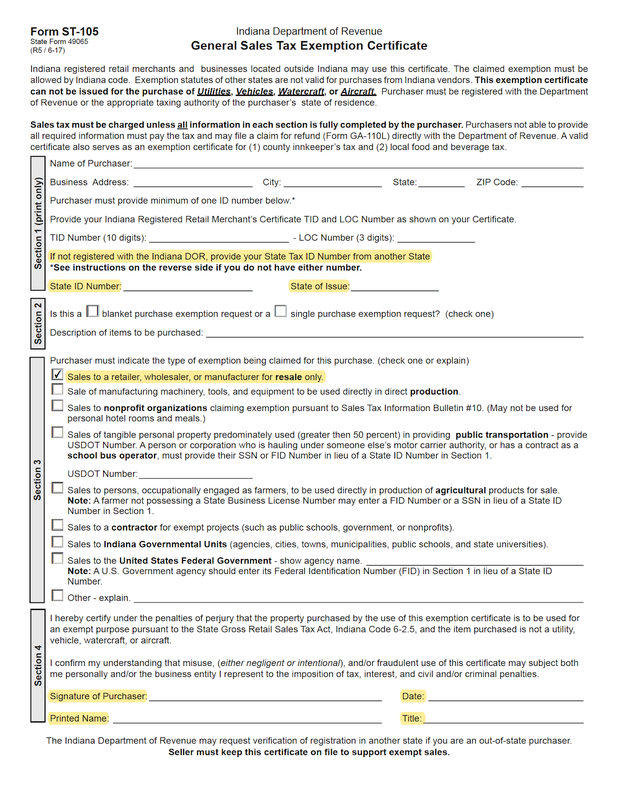 At the time of publication, Indiana has said they will not accept your resale certificate by itself however they will accept your resident State business license number or State issued resale certificate number if you complete their form ST-105 only then your purchases can be sales tax exempt. Where can I download the Indiana Exemption Certificate? Which sections of Form 51A105 do I need to fill out? If I do not submit a ST-105 to WSDisplay, how much sales tax do I need to pay for my drop ship orders to the state of Indiana? The sales tax for the state of Indiana is 7% across the state. What is taxable in the state of Indiana? Sales tax applies to all Tangible Personal Property, Labor as well as Shipping and Handling. Where can I get more information about what the laws are for remote sellers in the state of Indiana? I am an out of state reseller why do I need to pay sales tax in the state of New Jersey? Since WSDisplay currently has nexus in the state of New Jersey, the state requires us to collect sales tax on all drop shipments to the state unless they provide a New Jersey Resale Certificate. Does the State of New Jersey accept my out of state resale certificate for my resale purchases to be tax exempt? At the time of publication, the state of New Jersey will accept the following documents for sales tax exemption. If I do not submit any of the forms above to WSDisplay, how much sales tax do I need to pay for my drop ship orders to the state of the state of New Jersey? The sales tax for the state of New Jersey is 6.625% across the state. What is taxable in the state of New Jersey? Where can I get more information about Sales tax information for remote sellers? I am an out of state reseller why do I need to pay sales tax in the state of Kentucky? Since WSDisplay currently has nexus in the state of Kentucky, the state requires us to collect sales tax on all drop shipments to the state unless they provide a Kentucky Resale Certificate or complete their FORM 51A105. Does Kentucky accept my out of state resale certificate for my resale purchases to be tax exempt? 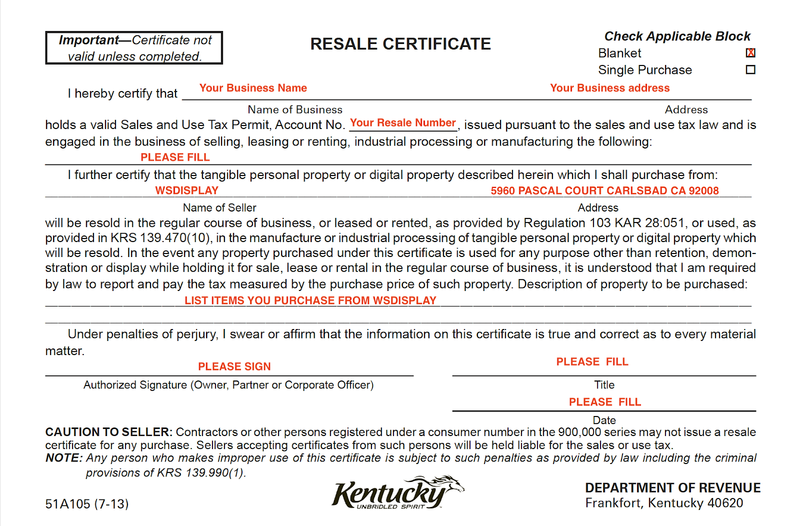 At the time of publication, Kentucky can not accept your resale certificate by itself however they will accept your resale number if you complete their form 51A105 only then your purchases can be sales tax exempt. Where can I download the Kentucky Exemption Certificate? Please see all sections in red that would need to be filled out. If I do not submit a FORM 51A105 to WSDisplay, how much sales tax do I need to pay for my drop ship orders to the state of Kentucky? The sales tax for the state of Kentucky is 6% across the state. What is taxable in the state of Kentucky? I am having WSDIsplay Dropship my order to the state of Michigan, why am I seen sales tax on my order? WSDisplay currently has a presence in the state of Michigan and we are required by law to tax all orders dropped shipped to the state of Michigan unless provided with an acceptable tax exempt form. If you are seen sales tax it means we do not have an acceptable tax exempt form for you or you company on our records. Which Tax exempt form does the state of Michigan required I provide WSDisplay for my dropship orders to be sales tax exempt? If I choose not to provide any of the sales tax exemptions above what is the sales tax rate for the state of Michigan? Where can I send my sales tax exemption form so no sales taxes are charges on my Drop-Shipped orders to the state of Michigan? You may forward a copy of your Blanket resale certificate to info@wsdisplay.com so we can update our system and no tax would be charged on future orders. Please keep in mind that a blanket resale certificate is valid for a four years period so you may be asked once this period has expired. For more information regarding drop shipments or how to obtain a reseller’s certificate or certificate of registration-use tax, see links below.